Mr. Nara Chandrababu Naidu is an Indian Statesman who has been the Chief Minister of Andhra Pradesh since 2014. Previously also he served as Chief Minister from 1994 to 2004, and as the Leader of Opposition from 2004 to 2014. He is currently the National President of Telugu Desam Party. He has won a number of Awards, including IT Indian of the Millennium from India Today, Business Person of the Year by The Economic Times, South Asian of the Year from Time magazine and membership in the World Economic Forum's Dream Cabinet. He chaired the National IT Panel under the NDA government and was described as one of the "hidden seven" working wonders around the world. At 28, he was the youngest Assembly member and minister. He was the longest serving Chief Minister of Andhra Pradesh, before the formation of the new Indian State of Telangana. He was longest-serving opposition leader of Opposition in the Andhra Pradesh Assembly. He was voted IT 'Indian of the Millennium' in a poll by India Today and 20:20 Media. He was named "SOUTH ASIAN OF THE YEAR" by the TIME Magazine, USA. He has been described as one of the Hidden Seven working wonders around the world, by Profit, a monthly magazine published by Oracle Corporation, US. 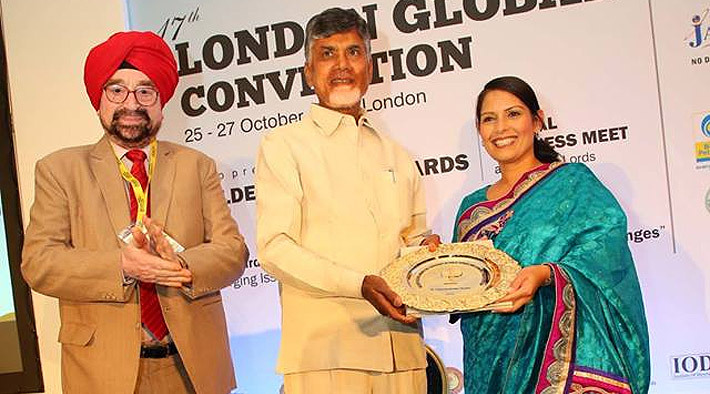 He was named Business Person of the Year by Economic Times, & was called the "CEO of Andhra Pradesh". The Pune-based organisation, Bharatiya Chatra Sansad, in partnership with MIT School of Governance, has honoured him with "Aadarsh Mukhyamantri Puraskar" (Model CM Award) in 2016. He was named 'Transformative Chief Minister Award' in May 2017 by USIBC. He is a potential Prime Minister of India.